Looking to break away from your side dish norm of green beans and broccoli? Here’s a dark green side that puts a twist on your weeknight rotation. Broccolini is a cross between broccoli and kale and it can be found in your grocer’s produce section. This delicious vegetable is a natural hybrid of the cabbage family and is absolutely delicious. Our favorite way to prepare this vitamin-packed green is to roast it in the oven. It’s also a great veggie to steam and it can be a perfect pairing with grilled steak. Preheat oven to 350. Line a cooking sheet with foil. In a small bowl, mix olive oil together with a hefty pinch of salt and pepper, add garlic to the mixture. Clean your broccolini by trimming about 1 inch off of the bottom. Spread the broccolini evenly on the cooking sheet. Using a pastry brush, apply your olive oil mixture evenly to each head and stalk. Finish with an additional pinch of salt. Roast in the oven for about 12 minutes. Serve with your favorite protein – enjoy! 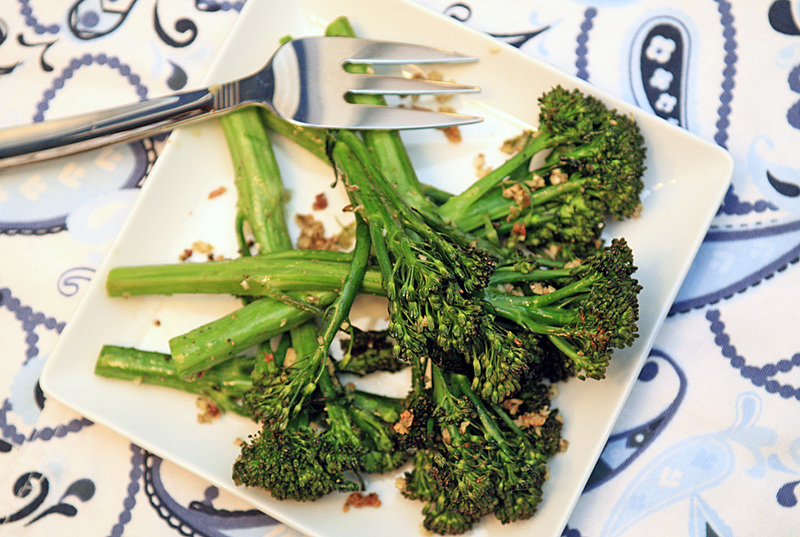 I thought broccolini was too ‘delicate’ for roasting, but will definitely try this!